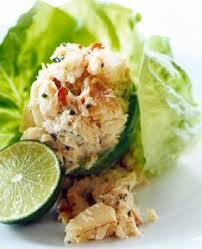 This spicy crab salad is a great stuffing for tomatoes, cucumbers or even a lettuce wrap. You could even stuff it in your favorite fish. You may substitute 1 teaspoon of Old Bay seasoning for the powdered ingredients. Steam the crab and chop into medium chunks. Toss with onions, spices, and liquid ingredients. Marinate for 15 minutes or more and serve over mixed green salad or add diced celery.